Best known for his detective thrillers, Meyer (Icarus, 2015, etc.) enters darker territory with this sweeping epic about a young Afrikaner boy’s survival in a post-apocalyptic South Africa. 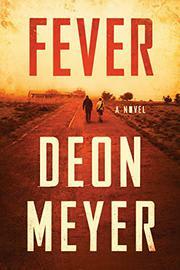 The story is set in the near future, where narrator Nico Storm and his visionary father, Willem, have “the Fever,” an airborne AIDS-related virus that has wiped out much of the world’s population. After barely surviving a mauling by wild dogs and the Fever, Willem sets out to build a new, enlightened society. He draws a ragtag support crew that includes Hennie Fly, an eccentric aviator, Domingo, who has a possibly criminal past, and Pastor Nkosi, who spearheads a revolt. The book is part ecological warning, part thriller (it is revealed up front that Willem will be murdered, but the culprit and circumstances aren’t clear until much later), part adventure saga (the survivors face repeated battles with a murderous band of looters known as the KTM), and part coming-of-age story, as Nico grows into a warrior and meets the love of his life when a new Fever survivor, Sofia Bergman, arrives at the compound. The narrative shifts, perhaps a bit too often, from Nico’s reflections to historical testimony by surviving characters. And neither Nico nor the Christ-like Willem evince the moral complexity of the heroes in Meyer’s usual thrillers. Despite some gripping moments and a haunting atmosphere, the book often sinks under its own ambitions, with too many weighty themes and parallel stories going on at once.